This past Sunday marked the final day of my trip to South Florida. Having taken care of the backcountry fishing, it was time to do some offshore fishing. I got in touch with Sig Ozols of Hot Shot Charters and set up a full day offshore trip, this time bringing along my old college roommate, Kyle. We met up with Sig for a 7 AM departure out of Dinner Key Marina in Coconut Grove. Sig’s mate, Chris, grabbed our bag – and more importantly our beer. We pushed off and started off to the fishing grounds. The inshore bite was dead according to reports, so we made the run to the further fishing grounds, about halfway to Bimini. That may sound like it’s really far away, but it was still only a 30-45 minute run. Once we got to our fishing grounds, Chris rigged up the rods, clipped them to the outriggers, and we started our troll. Not 5 minutes in, our down bait gets hit. I grab ahold of the rod and start cranking away. 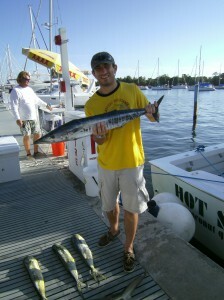 A couple minutes later, I have a beautiful 10-15 lb wahoo at the boat. Chris gaffed it and tossed it in the icebox. The morning was off to a great start. Chris reset the bait as Sig kept the troll going. A little while later, we start getting another hit on the down bait. This time Kyle grabs the rod, and brings in a smaller mahi mahi. Chris reset the baits and we readied ourselves for the next one. The morning grew later and Kyle and I were relaxing with a beer (come on, it’s 5 o’clock somewhere), when suddenly we saw a mahi mahi skipping through the air behind the boat. Sure enough, seconds later, it took a bait. I grabbed the rod and started the fight, but it managed to shake the hook. 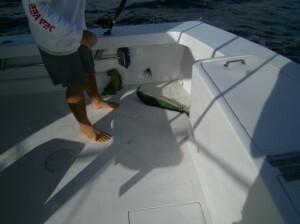 Through the rest of the morning, we put two more mahi mahi in the boat. We were hoping to find a school of the mahi so we could toss a fly line out to them, but no such luck. Sig asked us if we wanted to change things up, which meant it was time to go sailfishing. Sig set course for the sailfish grounds while Chris got the spinning rods rigged up. With a few hours left, Sig got the Hot Shot into position, and Chris let out the baits. A little time went by with no action, but we saw a sailfish hooked and dancing across the surface behind one of the boats several hundred yards away. We knew we were in the right spot, and it was only a matter of time before it was our turn. Not long after, we could see one of our baits start to get nervous. It was exactly what we were waiting for – a sailfish. It took the bait, and I grabbed the rod and started the fight. While I was grabbing the rod, we realized another bait was getting nervous. About 30 feet behind the boat, my sailfish crashed through the air as Kyle’s rod doubles over. We’ve got two sailfish hooked! Kyle’s starts jumping about 150 feet behind the boat, and his drag starts screaming. All the fun proved to be too much of a distraction for me, and I didn’t keep enough tension on my fish and it threw the hook. Kyle’s was still fighting strong. Kyle battled back and forth, with Sig passing along instructions and controlling the boat, while Chris stood by Kyle’s side to lend a hand when needed.The battle went on for about 5 minutes before our luck took a turn for the worse and our line got caught up, and the sailfish broke off. After we collected ourselves from losing the double, we had about an hour’s worth of fishing left, and we were optimistic for another shot. We reset the baits and began the waiting game again. Another nervous bait, and another fish on the end of the rod. I picked it up, and started battling. It felt like a pretty good fish, but we didn’t see any surface action. After a couple minutes of the fight, we were pretty sure we didn’t have a sailfish, but still knew it was something with decent size. The fish was close to the boat, and we realized we had ourselves a Silky Shark. The shark proved to be our last fish of the day, and while it wasn’t a sailfish, it was still a fun fight. Back at the docks, Sig cleaned and bagged our fish while Chris got the boat cleaned up. Sig apologized for the “slow” action, but I never would’ve guessed that action would’ve been considered slow. If that’s supposed to be a slow day, I can’t wait until the next time I fish with Sig and it’s a great day! Sig has a very laid back personality, and loves being on the water and having a good time. He’s your ticket to a great day on the water. Ready to book a trip with Sig Ozols aboard Hot Shot Charters? You can contact Sig via email at captsig@hscharters.com or call him at (305) 608-3913 or (305) 667-2129. Visit his website at www.hscharters.com for more information. Sig leads trips inshore, offshore, and on the reefs for everything from snapper to mahi-mahi, tuna, and wahoo to sailfish and marlin. Check out all our pictures from our trip on our Facebook album. I had been getting the itch to do some fishing down in Florida lately. Growing up on Cape Cod, I’ve done plenty of striped bass, bluefish, and bluefin tuna fishing, but have never had a chance to experience any warm water saltwater fishing. To solve the problem, I booked a plane ticket and signed up for a full day backcountry trip with Chris Hanson of Scales 2 Tales Charters. 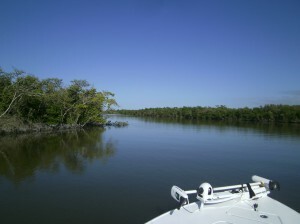 The plan was to fish the mangroves in Everglades National Park. 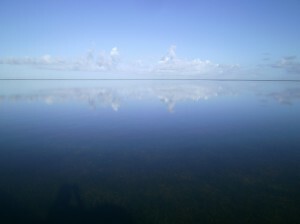 We took off from the dock in Key Largo in Chris’s beautiful 18 foot Ranger flats boat and made the run over to the park. Since the weather was great, it was a quick trip thanks to the 150hp motor. Along the way, Chris was sure to point out some of the wildlife – everything from the birds to the crocodiles sunning themselves. After we shot across the glassy water, we cruised into the mangroves to our first spot. Never having done this type of fishing, Chris rigged up a shrimp and showed me what to do, and what to feel for as the fish picked up the bait. Not even thirty seconds later, I feel a tap-tap-tap on the rod. I gave the fish enough time to swallow the hook, and started cranking. It didn’t feel big, but still had some fight to it. 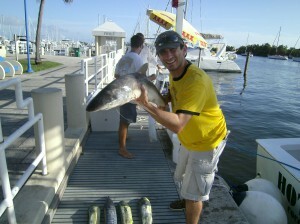 I had a small jack crevalle on the end of the line – not our intended target. Next cast, another jack. After that, a mangrove snapper. You have to weed through some of the small guys before you get the bigger fish. Finally, after another couple snappers, I had a bigger hit. The fish made a bit of a run, as I fought him to the boat. I got the fish to the side of the boat, and Chris grabbed my first redfish. 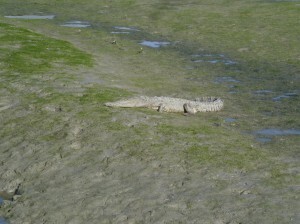 It was too small to keep, so we fired off a couple pictures and release him back to the mangroves. After tossing back a few more jacks and snappers, I got another big hit. 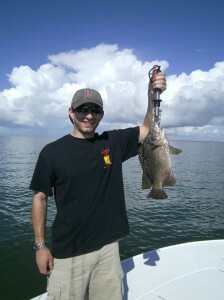 This time, I brought in a black drum – another first for me. We got a few more jacks and snappers before things started slowing down a bit and Chris jetted us off to another spot. mangroves to our first spot. Our next spot was a channel right at the edge of the Gulf of Mexico. We were in some faster current with the hopes of some bigger fish. We tossed out another shrimp, and shortly thereafter, another fish was hooked. I pulled up my first saltwater catfish. Chris has one rule aboard the boat – no catfish allowed inside. Luckily, I remembered before I pulled it aboard. I got another couple catfish before hooking into another black drum. I got another couple catfish before we decided there were too many kitties around. Looking to give me some variety, Chris took me out to the edge of the national park for some tripletail. We cruised along the stone crab traps until we saw a tripletail hanging out beneath a marker buoy. Chris assured me I’d find tripletail fishing a blast. After driving past a few buoys, we finally saw our target hanging out just below the surface. We circled around, and I tossed out a shrimp. The tripletail immediately swam over to it and ate it. I gave it a couple seconds to swallow the hook and started reeling. The rod had a nice bend, but my immediate thought was “what was all the fuss about?” No sooner than I finish the thought, and the tripletail realized it was hooked, and made a drag screaming run. THAT is what all the fuss is about. I battled it as it made a few more runs. I got it to the boat and Chris pulled it in. I was all smiles as I held my first tripletail. I was astonished to find a fish that fought that hard turned out to be just short of the minimum size! Chris snapped a couple pictures of me, and we set off to search for a few more. My next one was a nice four pounder that put up another heck of a fight. We got another small one and another keeper before heading back into the mangroves. Anchoring into another one of Chris’s sweet spots, he tied on a jig and topped it with a shrimp, and again showed me the right way to fish it. A mangrove snapper was the first to bite, but shortly thereafter, we got hit by a nice sized snook. 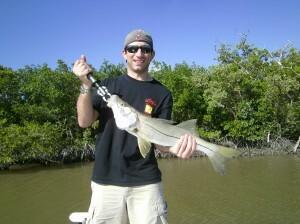 Putting up one of the best fights of the day, I had my first snook in the boat after a few minutes. The snook smiled for the pictures before we sent him off to swim another day. As the tide began to turn, things slowed down briefly – but not enough to stop me from catching my first sheepshead. Once we had some water flowing again, the bite picked right back up. We put another few redfish, some ladyfish (another first for me), and plenty of snappers in the boat. We had one particularly good sized redfish in the boat, but as Chris unhooked it and we were prepping for a picture, it saw an opportunity for escape and took it. The sun started getting low, so it was time to head back to the docks, happy and tired from a great day of fishing. Back at the dock, Chris happily filleted and bagged my keep and threw it on ice. I really can’t say enough about how great it was fishing with Chris. He’s a fun captain to guide you through the backcountry or on any trip he offers. If you want peace and quiet, Chris is fine with that. If you want to blast some music, have some beers, and joke around, Chris is fine with that too. The whole experience shows how much Chris really enjoys his job as a guide. On top of that, Chris’s knowledge of the backcountry is impressive. He easily navigates the maze of mangroves, and knows exactly how much water will be in each spot at any given time. He has a GPS on board, but I didn’t see him use it to navigate once. 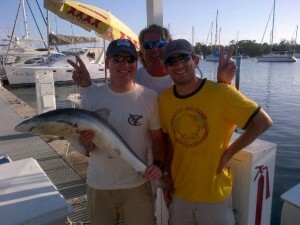 Ready to book a trip with Chris Hanson aboard Scales 2 Tales Charters? You can contact Chris via email at captainchrishanson@scales2tales.com or call him at (305) 522-3772. Visit his website at www.scales2tales.com for more information. 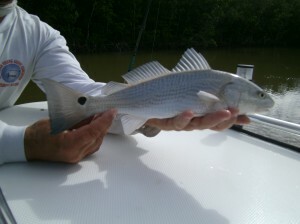 Chris leads trips in the backcountry and on the flats for species such as snook, redfish, tarpon, black drum, and more! Check out all our pictures from our trip on our Facebook album.